We have been providing koi fish pond cleaning services in Los Angeles for a decade, and we are one of the best around in koi fish pond care. Our knowledge with koi pond care covers pond algae control, pond cleaning, pond filters, pond liners as well as knowledge with pond plants. We have koi pond cleaning route from Beverly Hills to Los Angeles, to San Marino to Pasadena to Hollywood to Sherman Oaks and everywhere in between. 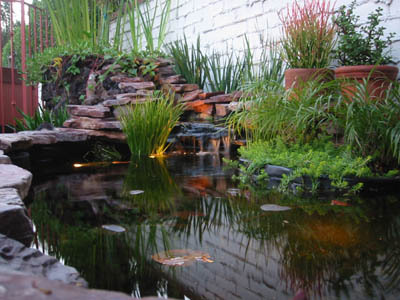 WCWG specializes in the designing and installation of Koi Ponds, Waterfalls, Streams, and fountains. Every last detail from proper filtration, to adding fish and plants is done with individualized attention. We also offer maintenance plans and refurbishing to existing water features.